Online Purchasing | CornerVine Inc.
Let your customers browse your entire inventory online and shop at their own pace. Take advantage of CornerVine features by making it easy for your customers to add items directly to their cart from recommendations and rating notifications from their friends. If you provide delivery, CornerVine is a great way to make it effortless for your customers to place orders online while saving your employees the time that would normally be spent on the phone. Even if you don't provide delivery, letting your customers place pickup orders in advance is a huge convenience and time-saver for them. Whether your customers are at home, in the office, or on the go, CornerVine provides an online shopping experience that's optimized for whichever device -- computer, tablet, or phone -- they may be using. Whenever new products become available in your store, they automatically become available for purchase online. 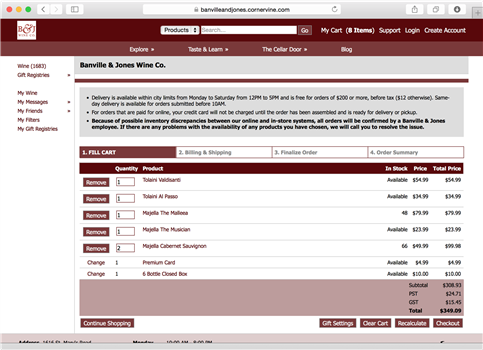 As your in-store inventory changes, the availability of your products changes automatically in your CornerVine site. Your store can offer its customers delivery, pickup, or both. CornerVine provides a simple way for your employees to see all details about orders in your site. You can assign one or more employees to receive email notifications as soon as new orders are added by your customers. If any products need to be added to or removed from an order, if discounts need to be applied, if shipping charges need to be changed, or if any unique products need to be added to the order, your employees can easily make all changes through your CornerVine site. Stripe.com is a leader in simplicity and features for online payment processing. Accounts are easy to set up and don't involve the long delays and multiple steps that many other payment processors force customers to deal with. CornerVine integrates directly with Stripe.com so all your order information, credit card charges, and bank transfers can be accessed directly from your CornerVine site, eliminating the need to login to Stripe.com. Set specific areas that are eligible for delivery using postal/zip codes. Enable free shipping for specific areas and shipping costs for others. Assign an optional minimum order value above which shipping becomes free. Specify the days and times that orders are available for delivery, when users are able to pick up their orders, and how much advance notice is needed for delivery and pickup.